Casa Romana sits at the foot of the Calvario steps in the seclusion of the old town, minutes from the best bars, cafes and restaurants on Mallorca, and a short walk to the Placa Major with its bustling Sunday market. There is one double bedroom with ensuite bathroom and two twin-rooms, which share a family bathroom. Beautifully decorated, with an intriguing corridor, which links a comfortable sitting room with a large dining kitchen. Air-conditioning, log-fire, TV, video, dish-washer and washing-machine. Peaceful and pretty internal patio garden with splash-pool and tiny roof terrace with stunning views. A studio with double bed and private bathroom over the kitchen is now available for an extra cost of £30 per night (5 nights minimum). The house: The house has everything you will need to make your stay comfortable and is designed to be lived in. Make it your home from home or use it as a convenient base for eating and drinking in or out as you please. And for relaxing, exploring having fun or just become part of a safe, cosmopolititan community. The location: The location is in the very heart of the beautiful and historic town of Pollenca, buzzing with life, charm and elegance. It is a romantic destination with some of the finest restaurants and funkiest bars in the north of the island of Mallorca. You will be a few minutes walk from a long relaxed lunch with a good value 'menu del dia' or from a night out with al fresco dining and drinking and no worries about driving home. The town has shops, bars, art galleries and two museums and manages to combine being very grown up with being a haven for families. Children are welcome everywhere and will love having an ice cream and playing with children of other nationalities in the town square. The town is a few minutes drive from two beautiful beaches, within 10 minutes drive of fabulous mountain scenery and less than an hour will take you to the cool city of Palma. There is wind-surfing, diving, golf, cycling and excellent horseriding nearby. We are both designers who have spent our working lives designing museum exhibitions and creating interpretation is historic houses, national parks and a range of castles and notable agricultural and industrial buildings in the UK. We both love history and old buildings. One of us loves hill walking, scrambling and generally hanging out in the mountains and the other loves swimming, the beach and horse riding. We both love exploring historic towns and villages and spending time in bars, cafes and restaurants. Another thing we both enjoy is a day out in a beautiful historic city with wonderful art galleries, stunning sea views, cool shops and fantastic restaurants. Palma is so easy to get to. We both love Mallorca and knew when we first came to Pollenca 15 years ago that we wanted to make a home here. We think Pollenca is the most lovely town in Mallorca and is perfectly placed for sea, mountains and enjoying the rest of Mallorca. We were looking for a property that we could visit regularly but which would be low maintenance when we were busy working in the UK. We really liked being in the middle of the historic town where you can walk into the square and meet friends for coffee and pop out to pick up the gorgeous produce available all over town. Wanting to cook things ourselves in a well equipped kitchen was a real driver in getting a place of our own. We wanted a completely unspoilt old house, which we could modernise sympathetically, keeping as many of the old features as possible. After a few months of searching and seeing many run down properties that didn't fit the bill, we saw that the house had a private for sale sign and we called the owner. This gentleman turned out to be the elderly parish priest in Port Pollenca and he wanted to sell the house which he had inherited but never lived in. It had been empty for 25 years. We immediately saw the potential to turn a modestly priced and completely unspoilt house into the sort of property we wanted. A place were we could holiday, spend Christmas, cook and entertain - with lots of room for family and friends to come and stay. It's always felt like a happy house and we have enjoyed quiet times, getting away from it all but only a few steps away from the heart of the most vibrant town we know. There have also been lots of family holidays, parties and dinners and memorably good times. This lovely old house is right in the middle of Pollenca but at the same time is in a quiet street. It is very cosy, comfortable and has a great deal of old world charm. You don't need a car to get around Pollenca - everything is in walking distance. This town was built for people and carts pulled by donkeys so a car is a nuisance in the narrow streets. We leave ours parked in the newer part of town until we need to use it. You can even reach the wonderful 'Piedra en Seco' footpath at the edge of town on foot and walk into the Tramuntana Mountains. If you hire a car, you can easily park a little way from the house and drive to any of 3 fantastic beaches in between 7 and 15 minutes depending where you choose to go, and you can be in Palma in 45 minutes. No worries about drinking and driving! Pollenca has some of the best restaurants on the island and there is a whole range of styles and prices to choose from. The main square is magical in the evening whether you are on a romantic getaway, with friends or family. Pollenca, like Casa Romana is a mix of charming historical architecture, quiet corners and opportunities for fantastic fun. Air conditioning in all rooms except bathrooms. Sheets and towels for washing provided and changed weekly. Washing machine is combined with a tumble dryer for when a quick turnaround is required. Excellent Jotul wood burning stove. It is impossible to park in the quaint narrow street where the house is. There is ample on street parking nearby and several free car parks in town. Easy to drive by and drop off luggage and shopping. The living room is large and comfortable and is a particularly attractive feature of this house. It contains historic furniture and paintings of local scenes. Well equipped kitchen with good quality utensils and a good range of crockery and glassware. We were delighted with Steve and Rosemary’s house in the old town of Pollença. 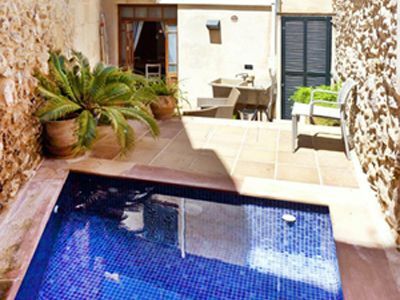 It’s well equipped and spacious with a pretty little courtyard and very welcome plunge pool in the heat. Our 18 month old son was especially pleased to discover the long passageway between the kitchen and lounge and was a great source of entertainment for him throughout our stay. The house is perfectly located for the town square and steps and worked very well for us as a family with a young child. Steve was a fantastic host and we absolutely loved our first visit to Pollença. Charming town house in the heart of Pollensa. Enjoyed the walk to the restaurants and shops, nearest being only a few minutes away. Highly recommend. Fabulous traditional Majorcan house in the centre of Pollenca. The accommodation provided absolutely everything needed, and probably more we didn't find/need/use, with a welcome plunge pool to cool down on a hot day. The house was spotless on our arrival, and owner Steve was so very helpful when we needed anything. I'd recommend this house with its quirky edge to anyone wishing to stay in and explore Pollenca old town and area. Beautiful town house in excellent central location. This is a lovely, spacious property, full of character, but with all mod cons! Great location, just a minutes stroll into the very centre. The lounge is lovely and cool during the day- which was a blessing as the temperature was around 30 c !!! The little roof terrace has fantastic views over Pollenca. Steve, the owner, was a fantastic host, we were extremely well looked after! Case Romana is a beautiful authentic house only meters from the Calvari steps. From the moment we arrived we felt we were somewhere special- though it was very easy to make ourselves at home. The views from the rooftop terrace are unique. The house was big and spacious enough to allow us, a family of 2 adults, 2 older teenagers and 2 younger children to live comfortably. The older two chilled out on the rooftop terrace while the younger ones aged 10 and 5 years spent hours bonding in the small but impressively engaging plunge pool. It also lent as a useful way to cool ourselves down at the end of a hot day. Only 6kms form Port Pollenca we used Casa Romana as a base to explore the Island - the fabulous mountains, many beaches and coves. It was easy to get to Palma, drach caverns , Formentor peninsula. The drive to Soller through the fabulous Tramauntana mountains was more of a challenge- but worth it for the views alone. Casa Romana was great to return to at the end of an eventful day and equally as good to chill out at for the whole day, taking a ramble or two around the shops, restraunts and sites of old Polensa town. Lovely traditional character property very close to all amenities and many great restaurants. We had a wonderful time , the town is lovely, people friendly and restaurants serve beautiful food. If you have a car you can really get a feel of this beautiful island...so much more than beaches. Pollenca is a historic town in beautiful, unspoilt Northern Mallorca about 40 minutes drive from the airport, near some of the island's most beautiful beaches and stunning mountain scenery. Ideal for walking and cycling holidays and sight seeing as well as relaxing by the sea. Rental rates are per week usually running from Saturday to Saturday, but bookings can be made for any number of days, which subject to availability can run from any day of the week. Bookings for more than one week and less than two will be charged on a pro rata basis. A studio room with sofa bed and private shower room can be made available at an additional cost of £30 per night.